While such statistics are certainly staggering, they do allow us to put into perspective what a threat cancer truly poses on an international scale, and thus leaving little doubt as to why cancer is among the deadliest and most feared diseases in the world today. As you probably know, cancer can come in numerous forms and variations such as: breast cancer, melanoma, lung cancer, leukemia, and many others. However, one particularly hazardous but somewhat lesser know type of cancer has emerged as perhaps one of the more dangerous and particularly deceptive forms of the illness. It claims the lives of as many as 7,500 U.S. citizens per year. This type of cancer as you may guess, is none other than oral cancer. With sinister trickery and life-threatening consequences, oral cancer is certainly not an illness to take lightly! However, despite its nasty reputation, oral cancer may seem relatively harmless at first. Initially you may notice a slight hoarseness or gravelly tone to your voice, and perhaps the appearance of ulcers or swelling around the mouth and neck region. While such minor nuisances may not exactly seem as a serious cause for alarm, they can in fact be more than they appear. As mentioned previously, deception is a key factor in oral cancer’s modus operandi. When a patient first begins developing oral cancer, the symptoms are typically minor and thereby left unchecked or dismissed. However, the patient may actually be in the early stages of developing oral cancer, without being aware of it! Unfortunately (like so many before them) the patient, unaware of their affliction does not seek treatment right away, thus allowing the cancer to continue to progress. It may only be when the persistent symptoms start to worsen, that the patient finally seeks out the necessary medical care. Tragically this required treatment may only come when the disease has already progressed into its latter stages, in which the cancer has proceeded to ravage the patient’s overall health, causing irreversible and often fatal damage. This scenario, (grim as it may be) is an important one to hear and learn from, as it illustrates the trap that many oral cancer patients have fallen victim to in the past. However, with the advent of oral cancer awareness month, (which goes from November 1st through the 31st) and the continued advancements in dental technology, the time to rise and fight back against oral cancer has never been better! 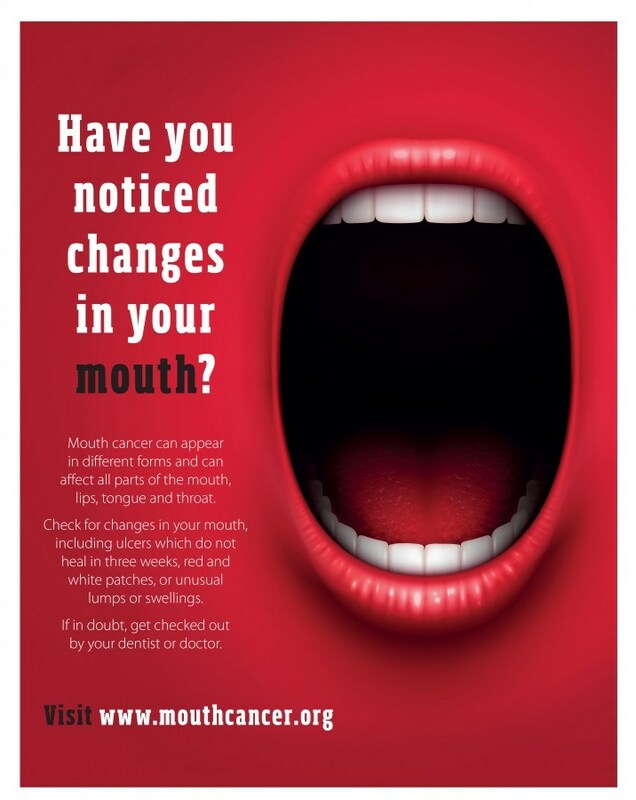 Oral Cancer Screening: Fighting the Good Fight! With so many lives lost and so many still in jeopardy, dentists everywhere have taken on the enormous task of going toe to toe with oral cancer, with the high hopes of putting the vial illness down for the count! While oral cancer is clearly not an enemy that will go quietly, professional dentistry may have found the Achilles heel of this vicious disease. So how exactly might the dental industry hope to tackle such a titanic-sized international issue like oral cancer? To put it simply, by stopping it before it starts! Although oral cancer can be quite debilitating if left untreated until its later stages, if detected within its early stages oral cancer can in fact be quite responsive to treatment, thereby increasing the chances of sending the disease into remission or eradicating it completely. To achieve this type of prevention, dentists are required to provide an oral cancer screening on all their patients, on a regular basis. While the term oral cancer screening might sound relatively new, but in reality, oral cancer screenings have been stopping the illness in its tracks for a number of years now, and continues to become increasingly more effective and accurate as the years go by. While this might come as a something of a surprise, what may likely surprise you even more is the fact that you yourself have more than likely received an oral cancer screenings without even knowing it and probably multiple screenings! The oral cancer screening may in fact be the dental profession’s best kept secret, as many patients are unaware that they are receiving the screening even as it happens. An oral cancer screening is a quick and painless procedure that Dr. Charles R. Kimes at Overland Park Dentistry preforms as part of your standard dental exam. Therefore, when you come in for your routine dental checkup, you are simultaneously receiving an accurate screening for any early signs or symptoms of oral cancer. By identifying and receiving the necessary treatment for oral cancer early on, you have struck a major blow in the battle against the disease, and may very well be on the road to recovery. Related Article: Dental Appointment: Why Twice a Year? While Dr. Kimes will undoubtedly be a powerful ally in the battle against oral cancer, to truly receive the best results possible, you must be willing to make some changes in yourself. It should presumably come at little surprise that a person’s lifestyle often plays a significant role in the development and recovery process of oral cancer. While typically occurring in individuals 40 years and older, the development of oral cancer is often directly linked to heavy alcohol and tobacco consumption, as regular users of such products have an almost ten times greater chance in developing the disease, and those that continue to use them will have limited chance of recovery. While much of the information provided above may not exactly present the bright and cheerful message that you may be accustomed to this time of year, please remember that the purpose of this article is to remind you that there’s still time to change this! Therefore, if you do have any concerns or anxiety over your chances of developing oral cancer, taking the time to schedule a routine dental checkup/oral cancer screening, is unquestionably the right decision. Although far too many people have been dealt the cruel hand of oral cancer in the past, and have tragically had to face the consequences, YOU have the power to change this for yourself! Please don’t become another statistic, let’s take a stand against oral cancer together! Dr. Charles R. Kimes, DDS and his expert team at Overland Park Dentistry look forward to having the opportunity to care for you and your family with any preventative, restorative or cosmetic needs you or your family may have. To schedule your dental appointment / oral cancer screening, contact us at our south Overland Park office at (913) 647-8700 or our north Overland Park office at (913) 341-2380.